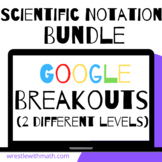 Scientific Notation Operations – Breakout Bundle with Google Forms! 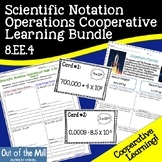 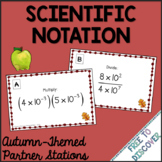 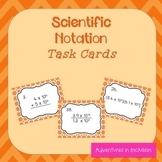 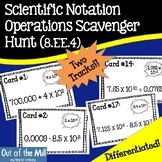 This product includes 40 task cards that cover, adding, subtracting, multiplying and dividing scientific notation. 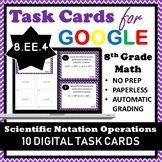 It includes 10 cards for each operation with varying degrees of difficulty. 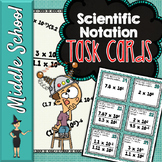 It some cards with regrouping. 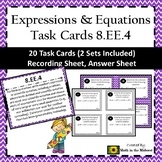 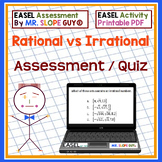 These task cards are great for math remediation, extra practice, or centers. 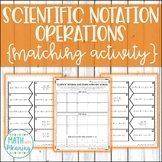 This easy-to-read chart shows students how to add, subtract, multiply and divide Scientific Notation problems. 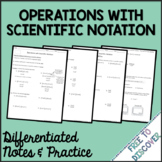 It can be used as notes, a supplement to notes or a valuable resource for students to keep with them. 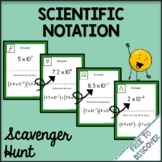 This scavenger hunt is a great self-checking activity. 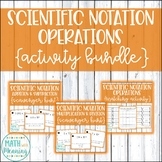 Students will add, subtract, multiply, and divide scientific notation. 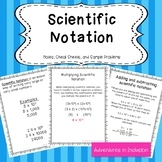 They will need to be able to change from standard to scientific form (if they cannot use a calculator). 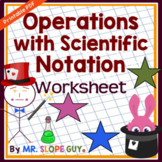 This lesson provides students a chance to practice and understand how to write large and small values in scientific notation. 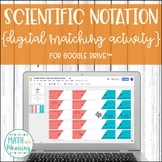 It also provides some practice problems and an outline for a class discussion on how to multiply and divide numbers in scientific notation.